AP ECET Seat Allotment Result 2017: Jawaharlal Nehru Technological University Anantapur has conducted the Engineering Common Entrance Test on 3rd May 2017. Qualified candidates attended for certificate verification from 22nd June to 25th June 2017 at any one of the 18 Help Line centres. It has released the AP ECET Seat Allotment Result 2017 on its official website apecet.nic.in. You can check your Andhra Pradesh ECET Allotment Order by following our guidelines. Visit the official website apecet.nic.in and enter your Hall Ticket Number and Password to check your allotment. Concerned authorities have released the result based on rank and the category to which he belongs. APSCHE stands for Andhra Pradesh State Council of Higher Education. On behalf of APSCHE, JNTUA conducts Engineering Common Entrance Test for the candidates who wish to take admission into various Pharmacy and Engineering Colleges in Andhra Pradesh. 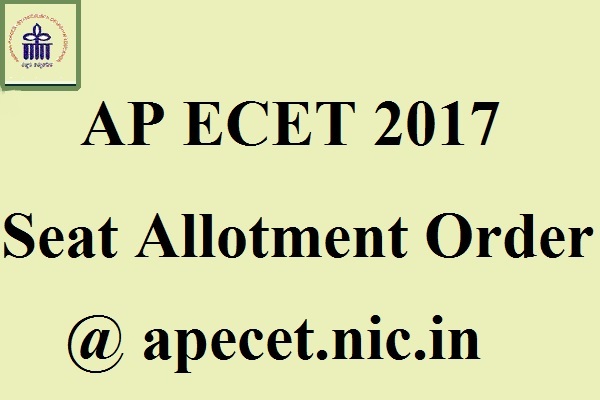 You can check your AP ECET 2017 Seat Allotment Result from the official website apecet.nic.in. If you are satisfied with AP ECET 2017 Phase 1 Seat Allotment Result, then confirm your seat. Allotment order contains all the details regarding details of joining, allotted college name and branch. Pay the admission fee through challan mode and take the printout of AP Engineering Common Entrance Test Allotment Result with you while reporting. This year number of candidates for ECET Counselling has declined drastically. For a total of 71950 seats only 18650 applications received, which is 1/4th of the total number.18931 students attended for the ECET first phase counselling and 18650 members had opted for web-options. Candidates who are not selected in ECET Phase 1 allotment follow the steps you followed in phase 1. In Phase 3 all the vacant seats will be filled by the candidates who scored rank in ECET. Follow our website www.Techfactslive.com on Facebook & Twitter to get all the latest updates regarding AP ECET Phase 2 and Phase 3 Seat Allotment Results. If you have any Problem Contact us at [email protected].